On a weekend where Maryland and Navy were idle while Virginia and Virginia Tech were on the road, the spotlight shined on the commonwealth's capital as James Madison roasted Richmond, 63-10. WASHINGTON — On a weekend where Maryland and Navy were idle while Virginia and Virginia Tech were on the road, the spotlight shined on the commonwealth’s capital as James Madison roasted Richmond, 63-10. As September ends, the #2 team in FCS appears to be on another collision course with North Dakota State. Concerns that Ben DiNucci wouldn’t be able to pick up where Bryan Schor left off were unfounded: The junior is completing over 70 percent of his passes, and he’s hurting teams with his feet as well. Senior running back Marcus Marshall is taking his final trip through the CAA in style, averaging 8.8 yards per carry. But what puts this year’s team on track for a fourth straight conference championship is a defense that has allowed just a pair of touchdowns since their opening-day loss at NC State. 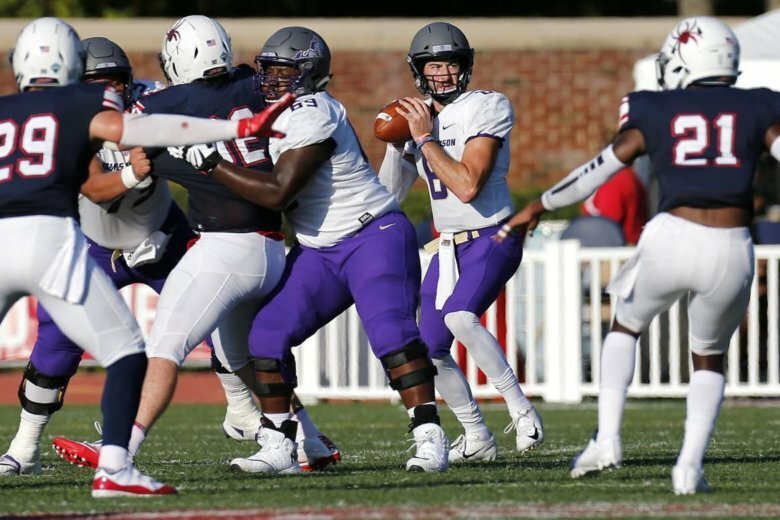 On Saturday, the Dukes forced five turnovers against the Spiders. James Madison’s Jimmy Moreland returned one of the team’s three interceptions 100 yards for a touchdown…taking the highlight thunder away from Jawon Hamilton, who returned the opening kickoff for a TD. That’s right — JMU shines on special teams, too: D’Angelo Amos ran a punt back for a score against Norfolk State and averages 23.6 yards per return (foes now wisely kick out of bounds). October’s schedule features three games against teams that were ranked heading into last weekend: #9 Elon, #14 Villanova and #17 Stony Brook…with the Wildcats game the only one on the road. Three tough tests that will show if JMU fans should be making plans for early January. Virginia (3-2, 1-1 ACC) enters its bye week on a bad note: The 35-21 loss at NC State gives coach Bronco Mendenhall plenty to work with before they resume conference play against the Coastal Division favorite. Cavalier Congrats: Olamide Zaccheaus caught nine passes for 109 yards and two touchdowns while leading the team with 39 rushing yards. Silver Spring’s Charles Snowden paced the defense with 11 tackles. Punter Lester Coleman averaged 48.8 yards per kick. Cavalier Concerns: The defense failed to generate a three and out…and allowed the Wolfpack to convert 8-of-13 third downs. The running game managed just 3.2 yards per carry, with Jordan Ellis once again unable to produce against an ACC foe (he’s gained 98 yards on 33 tries in two conference games). Next: Oct. 13 against 4-1 Miami. Virginia Tech (3-1, 2-0 ACC) bounced back from its loss at Old Dominion to defeat #22 Duke, 31-14. Coach Justin Fuente has to be road-wary by now, as three of his team’s four games to start the season have come away from Blacksburg. Hokie Highlights: Kansas-transfer Ryan Willis stepped in for the injured Josh Jackson and threw for 332 yards and three touchdowns. Houshun Gaines tallied 2.5 sacks, while Rayshard Ashby notched 15 tackles…as the defense held the Blue Devils to 4-16 on third down. Hokie Humblings: The running game was held in check, managing 81 yards on 41 carries. VT was fortunate to recover both of their fumbles; one was inside their own 10-yard line. Next: Saturday at #8 Notre Dame.